Rubber Room Ramblings: NEW FRAMELIT STORAGE AREA! I have been super busy lately, but have not meant to be neglecting my blog and sharing creative ideas with all of you faithful blog readers. My sister was visiting last week, and I took some time away from my computer to just be with her. We had a wonderful visit and it was very productive too. I had a couple classes/groups last week that kept me busy AND there was a ton going on at Stampin' Up!. My first priority was to get you caught up with the Stampin' Up! sales and updates. Then I started feeling a little "punk". Not getting the flu, but definitely not feeling 100% (sniffles, throat tickle, achey, tired...). Doubled up on supplements and laying low trying to not get a full-blown cold!! So, sleeping lots and resting lots. 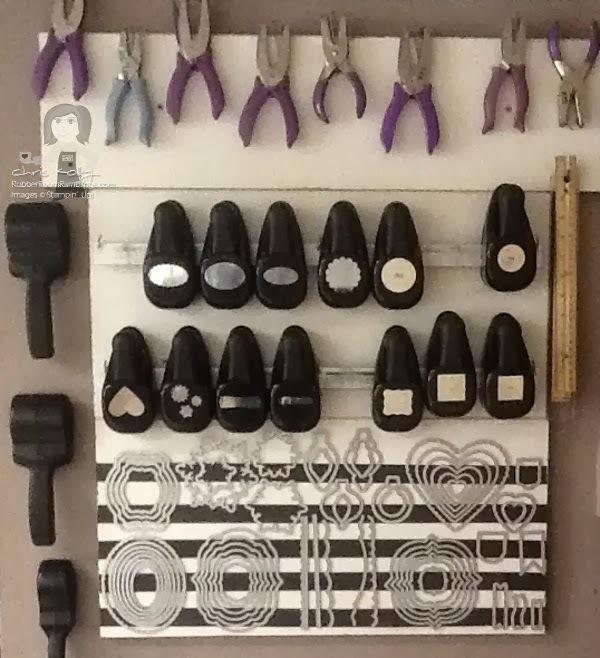 Most of you who have visited the Rubber Room and/or know me through this Blog or Stampin' Up! know that I am extremely organized. I credit my organization to my ability to get as much done as I do. Organizaton helps me keep it all straight and moving in the right direction! Last week I started a little "organization" makeover, if you will. Since Stampin' Up! introduced their new-style punches, I have slowly been replacing my old-style punches. 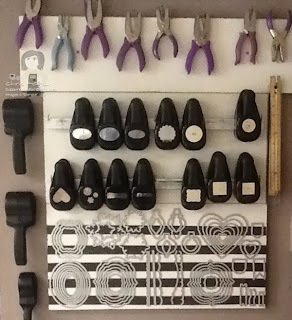 I had a great space for my old-style punches, but it was starting to look a little "empty". I had lots of the skinny-style stamp cases (the ones that hold the clear-mount stamps) that were decorated with beautiful DSP, and there was a magnet on the inside to put my framelits in. I wanted to be able to see my framelits. I firmly believe, if you don't see it, you don't use it. I don't want to waste my creative time looking in drawers for stuff. Some of you may remember the corkboard that I put little round magnets on for my framelits. I have since outgrown my little board. To cut to the chase here, this is my new framelit storage spot. As you can see, there will be lots of "expansion room" as more and more punches are retired and/or replaced. I purchased a role of magnet (the black strips behind the framelits), and just stuck it to the wood.My framelits love their new home, and I love them being out where I can see all of them!